The Harman Kardon Onyx Bluetooth speaker serves up bumping bass and killer volume suitable for parties indoors and out, but questionable Wi-Fi connectivity keeps it from setting the roof on fire. Shopping for a portable Bluetooth speaker can be a bit daunting – the market is crowded with choices in varying form factors, feature sets and price points. Not to mention size: there are speakers that fit in the palm of your hand, like the WooFit, and speakers that require the use of your whole arm. 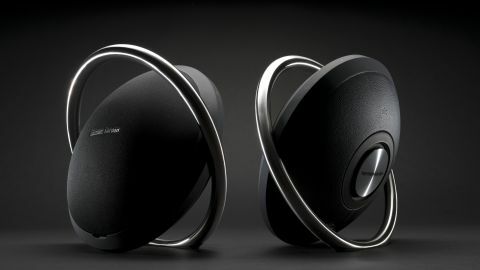 The Harman Kardon Onyx skews toward the latter, with a heft befitting of its volume and bass capabilities. At $500 (about £292, AU$534), this unit falls squarely into the high-end segment of the portable speaker market. Still, the fact that it's more than suitable for day-to-day, in-home use as well adds quite a bit of value. In the Onyx's case, big is in fact beautiful. The speaker features a unique circular design tilted at a slight angle, replete with high-end touches of steel and leather. A rather ergonomic (and durable) brushed steel handle encircles the unit, which is covered by a removable cloth grill on the front. Removing the speaker grill reveals four transducers: two three-inch woofers and two three-fourth-inch tweeters. The Onyx also has dual passive radiators under the hood, which lend to the balanced sound profile. Flipping the speaker around reveals a textured leather backside with a circular silver label that dances accordingly when you play a song with heavy bass, providing some pleasing visual feedback for those who love the lower audio range. The top edge of the Onyx houses the LED-backlit, touch-sensitive controls, including a power key and volume controls as well as the Bluetooth and wireless buttons/indicators. It's rather pleasing that you can run your finger between the "+" and "-" indicators to adjust the volume, kind of like stroking the back of a cat – one with no fur, that is.